Autumn 1886. In New York, all eyes are turned towards Liberty Island. The President of the United States, along with hundreds of handpicked guests as well as several thousand spectators, have all gathered for the inauguration of a work such as the world has never yet seen. Signed by the French artist Bartholdi, this monument bears a name that is destined to become a legend : Liberty Enlightening the World. A gift from France to celebrate the centenary of the Declaration of Independence of the United States, the exceptionally sized work of art was to become a symbol of human rights. For millions of immigrants over several decades, this victorious figure towering over the bay of New York would be the first image of their American dream and the embodiment of all their hopes. It has asserted itself, across time and oceans, as the ambassadress of all those who proclaim their attachment to independence and to that most precious of all values : liberty. On the occasion of the 125th anniversary of the Statue of Liberty, RJ-Romain Jerome is unveiling the fruit of an unprecedented collaborative endeavour with The Statue of Liberty-Ellis Island Foundation and Gold Leaf Corporation. This encounter has resulted in a new RJ-Romain Jerome timepiece merging the brand DNA with that of Miss Liberty, thereby giving shape to a new symbolic legend : Liberty-DNA. Loyal to the aesthetic of the Statue of Liberty, the bronze bezel of this 125-piece limited-edition timepiece is adorned with 12 spikes reminiscent of the statue’s famous crown. It will acquire a delightful patina as it ages over time, thereby adopting the colour of the original, whose precious DNA is featured on the dial1. Particles of Miss Liberty have been incorporated into the verdigris dial which also evokes the colour of oxidised copper. The facetted hands are bronze coloured and the vintage brown alligator leather strap sets the perfect finishing touch. The medallion on the case-back of the watch depicts the flame of liberty lighting up the stars and stripes of the American flag. The watchmaking Maison thus pays tribute to the most iconic of all emblems of liberty. 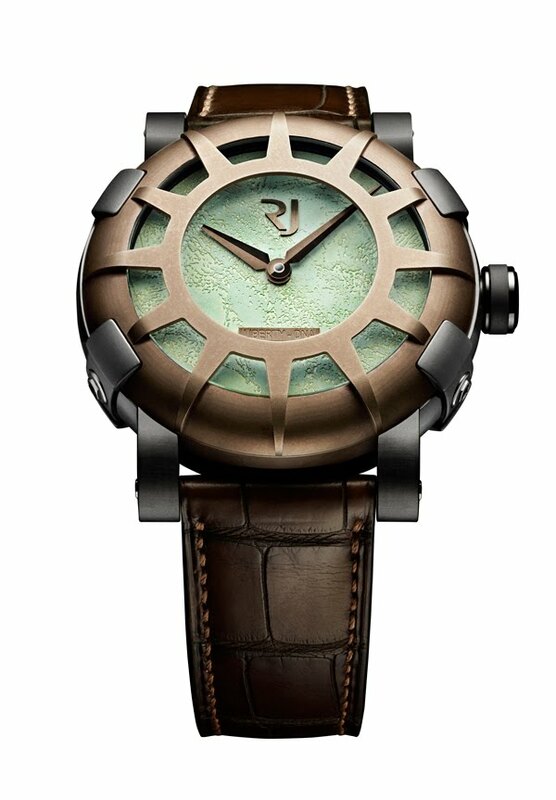 In placing its watchmaking expertise at the service of Lady Liberty, RJ-Romain Jerome bears testimony to history and plays its part in striving to ensure that liberty continues to enlighten future generations. The Statue of Liberty-Ellis Island Foundation, Inc. is a non-profit organization founded in 1982 to raise funds for and oversee the historic restorations of the Statue of Liberty and Ellis Island, working in partnership with the National Park Service/U.S. Department of the Interior. In addition to restoring the monuments, the Foundation created a museum in the Statue’s base and the world-class Ellis Island Immigration Museum, The American Immigrant Wall of Honor®, the American Family Immigration History Center® and its newest project The Peopling of America® Center scheduled for completion in 2013. Its endowment has funded over 200 projects at the islands. Gold Leaf was established in 1984 and is the exclusive partner of The Statue of Liberty – Ellis Island Foundation, Inc. for artifacts preserved from the centennial restoration of the Statue of Liberty National Monument and Ellis Island. Gold Leaf is dedicated to utilizing the artifacts preserved from The Statue of Liberty & Ellis Island in specially designed programs to perpetuate the idea and spirit of “Liberty Enlightening the World”.